If you visit this blog regularly, you may have noticed the change in oven tops a few months back. You may also have noticed in the picture above that it’s my old oven. This dish happens to be the very last baked in my old oven. The next time I tried to use it, it simply never heated up. Somehow, I forgot all about posting this recipe, even though it was very tasty. In fact, I’m now planning on making it next week for dinner one night. I happened to be looking through a folder of pictures I had, because I am that person who takes pictures pretty much every time she cooks or bakes something, just in case I decide to blog about it later. With the drama surrounding the new oven this summer, I forgot all about this intended post. But here it is. 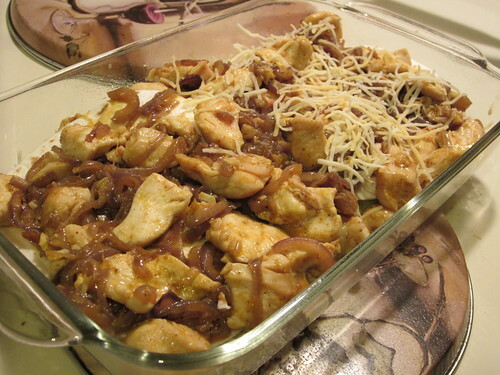 And just a little tip: if you’ve got leftover chicken to use up or are in a hurry, substitute your leftovers for the chicken called for in the recipe (or use a shredded rotisserie chicken); simply mix the cooked chicken in with the cooked onions and garlic before assembling the casserole. Cut chicken into bite-size pieces and toss with salt, pepper, cumin, and cayenne. Heat olive oil in large frying pan set on medium-high heat. 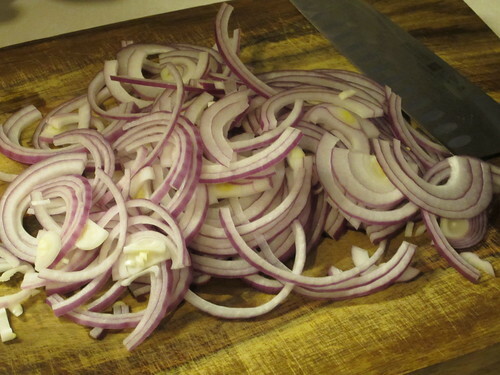 Saute the onion until it’s soft. Add the garlic and cook, stirring continuously, until fragrant. Add chicken and cook until opaque. Remove from heat and set aside. Spray a 7×11 inch (18×28 cm) glass baking dish with cooking spray. 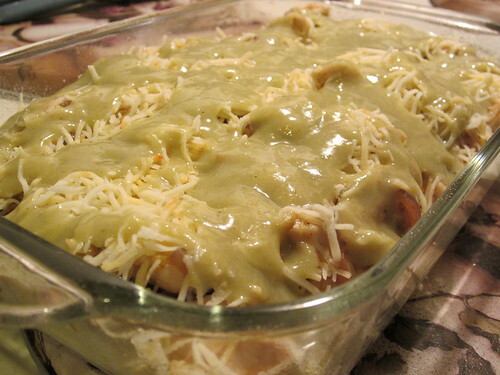 Cover bottom with two tablespoons of enchilada sauce. Spread 2 tortillas over bottom of dish, cover with half the chicken mixture, one-third of the cheese, and 1/3 of the remaining enchilada sauce. Add another layer of tortillas, chicken, cheese, and sauce. 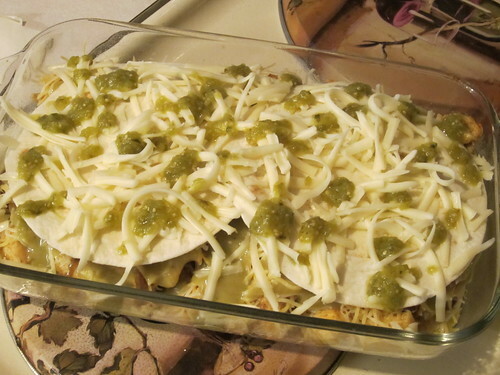 Cover with two additional tortillas, if desired, then remaining cheese and sauce. If desired, top with some canned green chile sauce. Bake 25 minutes, or until cheese is melted and bubbly. If baking later, cover pan with plastic wrap and refrigerate up to one day before baking. Remove plastic and bake in a 325 degree oven for 35-45 minutes. Let stand 5 minutes before cutting. 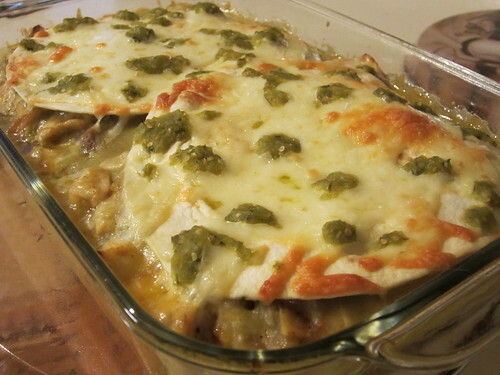 Top with green chile sauce and sour cream, if desired.